In 1904, a man from Chicago by the name of Vernon Seaver made his way into Central Illinois with a plan. 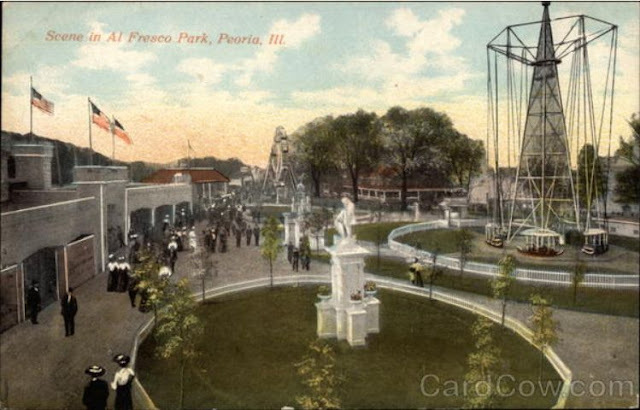 Seaver, president of the Trans-Continental Amusement Company, wanted to provide Peoria with a trolley park . 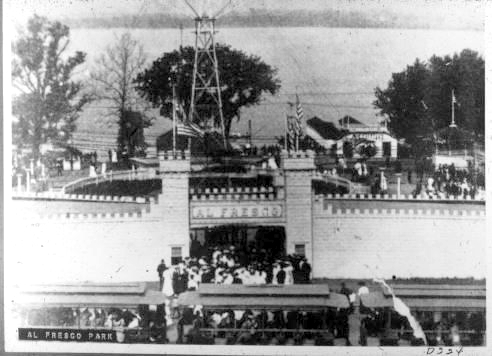 The entrepreneur had constructed White City Park in Chicago and was prepared to model the Peoria park after it. He allegedly anchored his yacht at the foot of Main Street in the Illinois River and searched the area for the ideal location for his creation. The area Seaver landed on was in Peoria Heights, off Galena Road, adjacent to the Illinois River. Thomas Webb, a prominent Peoria diamond jeweler, owned the land, and agreed to participate in Seaver's project. All Seaver needed now was financial assistance. Luckily, John Finley, head of the Central City Streetcar Company, backed funding for the park. 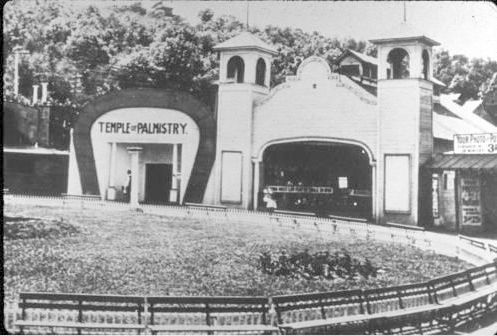 Finley's assistance didn't come merely from the kindness of his heart; he figured that the amusement park would bring enormous amounts of business to the streetcar company during the summer months. As the future popularity of the park would show, he was correct. Construction of the park began immediately. 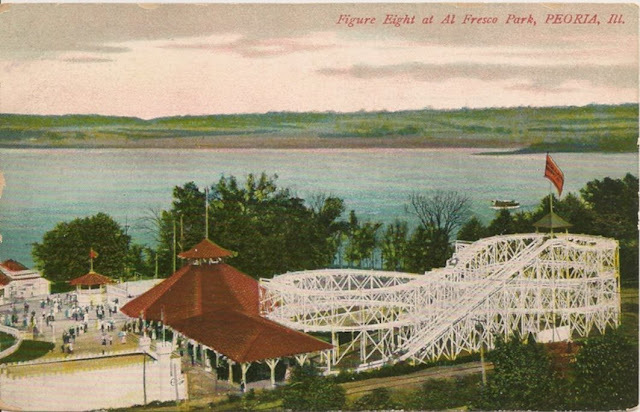 Seaver obtained the services of the Ingersoll Amusement Company to build many of the park's main attractions, including a 65 foot-high Ferris wheel and a figure-8 roller coaster. 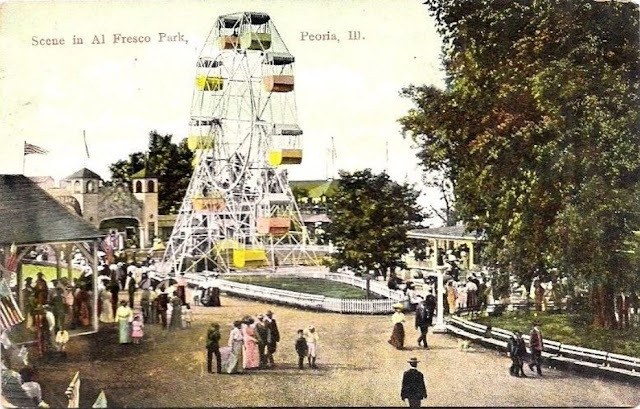 Most of the rides contained within the park were the first of their kind in Central Illinois. 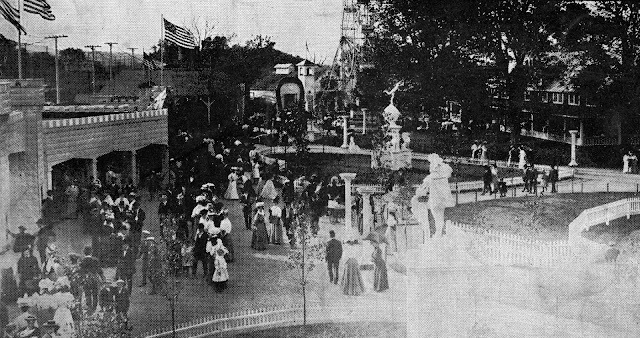 Not all the rides and attractions were built from scratch; the 1904 St. Louis World's Fair provided statues, benches and lights to the park. Word quickly spread of the park's construction and residents of Central Illinois eagerly anticipated the opening of their newest attraction. 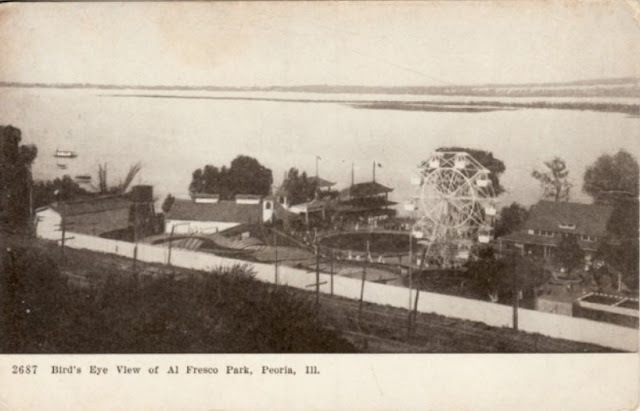 Seaver named his park Al Fresco, meaning "Open Air", and in a March of 1904 an article of the "Journal Star" declared it be a "summer resort free from all vulgarity, where families can go and have innocent enjoyment." 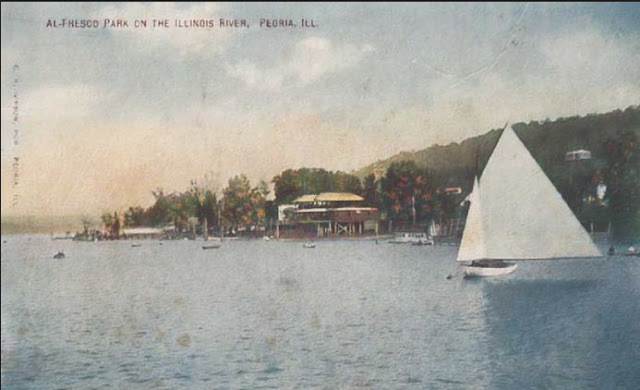 The article's anonymous author sang Seaver's praises, stating that "such a place has been a long felt want in Peoria and it seems a wonder that in a prosperous city like Peoria, no one has been enterprising enough to inaugurate a place like this." 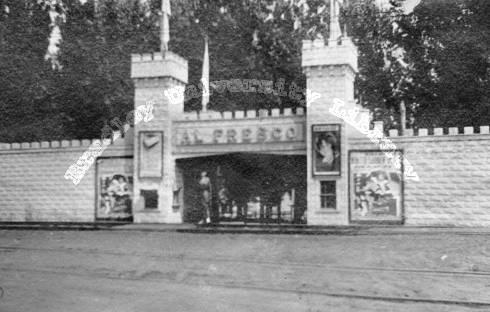 The completed Al Fresco Amusement Park deserved such declaration. It truly was a marvel. Besides the Ferris Wheel and figure-8 roller coaster, Al Fresco's also featured a number of games and other frivolities. Many attractions to the park could be considered dangerous by today's standards. High wire and high diving acts were quite common, and diving horse acts and motorcycle jumping acts also afforded a dangerous pleasure. Perhaps the most incendiary of Al Fresco's performances was what was called the "slide for life." In this act, a wire was attached to the top of the circle swing ride and stretched to a point on the river. A man was doused with kerosine, set afire, and before he burned himself alive, slid down the wire into the Illinois River. Also in the park was a two-story pavilion called the Japanese Garden. The second floor featured a movie house that frequently screened films by Charlie Chaplin, while the ground floor housed a pavilion and beer garden. 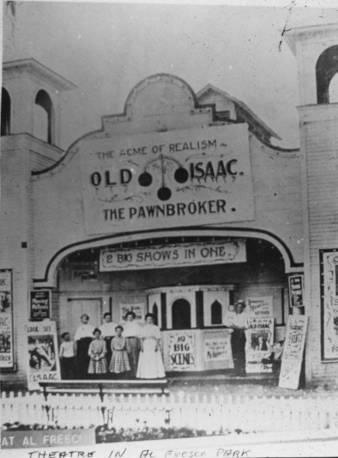 This area hosted a number of vaudeville acts and other performances. Some of the famous faces to grace the stage were escape artist Harry Houdini and boxers John L. Sullivan and Jim Corbett. Frequent performers included bands and orchestras, Buffalo Bill's Wild West Show, and the Cherry Sisters, a three-person singing act. The Cherry Sisters hailed from Iowa, where their father was forced to mortgage his farm. The sisters formed their singing team to help him. They were by far the most popular act, despite the fact that they sang so badly audiences would throw things at them, forcing them to perform from behind a screen. Another important draw to Al Fresco was Dewey Beach, which allowed visitors the opportunities to swim and fish. Two bath houses lined the beach, where bathing suits could be rented for 10¢-25¢. Fishing boats were also available. Al Fresco's boat dock contained a popular barge decorated to resemble a battleship. Admission to the park was 10¢ for adults and 5¢ for children. In the summers between 1905 and 1927 nearly 10,000 people visited the park daily. Vacationers poured in from all around the Midwest, most of them traveling by ship from St. Louis and Chicago. Locals flooded the park as well, and arrived there by various modes of transportation. Many came by streetcar, while others simply parked on Grandview Drive and walked their way to the park via Gibson Pathway. Those who could afford it took steamboat rides from downtown Peoria. One 1918 steamboat ride in particular ended in tragedy. As the Columbia brought passengers back downtown after a day's fun at Al Fresco, a hole was torn in the hull, sinking the boat and claiming the lives of 87 of the 500 passengers aboard. A memorial was dedicated to the victims in 2003. For most of the twenty-odd years that Al Fresco was in business, however, it maintained the air of innocent fun that Seaver had anticipated. The park and its attractions flourished until the late 20s. Attendance rates began to drop during World War I, but natural causes would ultimately result in the death of the park. During the 20s, the Illinois River, raised by Chicago drainage, permanently flooded portions of the park. Several rides were damaged by this flooding and were never repaired. The dismantling of the famous figure-8 roller coaster in 1928 marked the end of Al Fresco Amusement Park as it was formerly known. In 1929 the land was leased to Fred C. Feyler, who rented the area out to traveling circuses. Swimmers and picnickers still flocked to the area until World War II. Due to an enormous drop in attendance rates, Feyler declared that all men in uniform would be admitted for free. However, Feyler did not anticipate the number of soldiers that were stationed at nearby Camp Ellis. After his announcement, hundreds of men flocked to the once-popular amusement site. The park was forced to officially close in 1944. Today, Al Fresco's address is 4602 N. Galena Road. Occupying the land where thousands of vacationers once frolicked is a trailer park and a private club. The Illinois River is no longer as clean and scenic as it used to be. 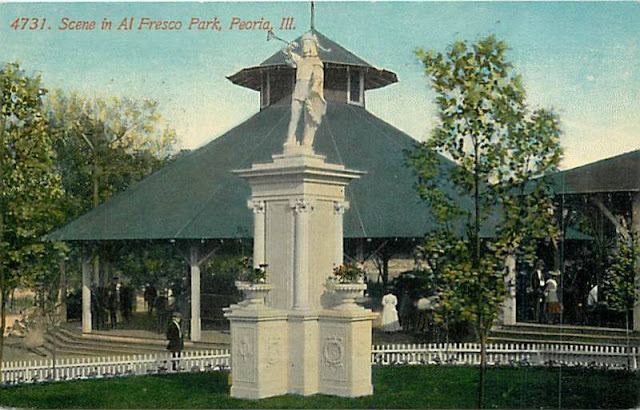 Though times have changed and the Al Fresco Amusement Park is largely forgotten, the delight and diversion it once brought during its short existence is definitely something to remember this summer. 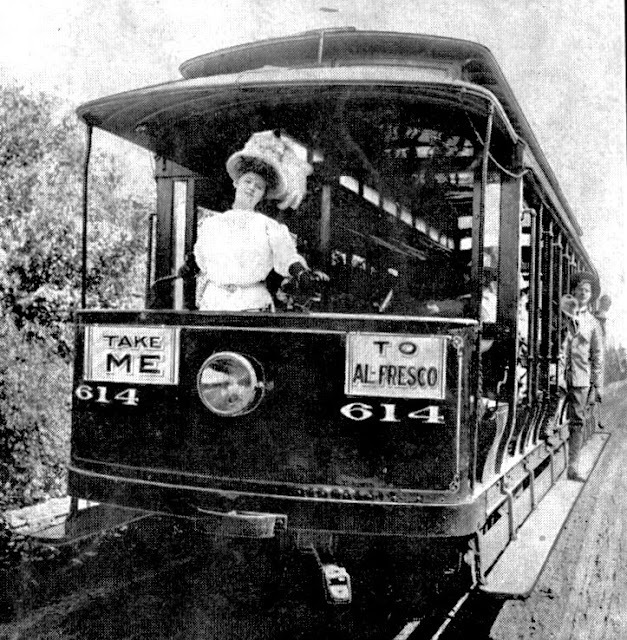 TROLLEY PARK - In the United States, trolley parks, which started in the 19th century, were picnic and recreation areas along or at the ends of streetcar lines in most of the larger cities. These were precursors to amusement parks. These trolley parks were created by the streetcar companies to give people a reason to use their services on weekends. These parks originally consisted of picnic groves and pavilions, and often held events such as dances, concerts and fireworks. Many eventually added features such as swimming pools, carousels, Ferris wheels, roller coasters, sports fields, boats rides, restaurants and other resort facilities to become amusement parks.